Advanced basil downy mildew breeding lines of sweet basil developed by the Basil Breeding Team at Rutgers University. 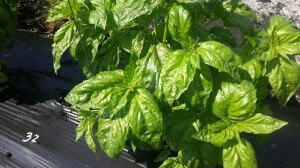 These basils appear to be resistant to downy mildew, and finally have the appearance and aroma of traditional sweet basil as well. Rutgers is also developing new ornamentals, edible ornamentals and Thai basils with resistance to downy mildew. 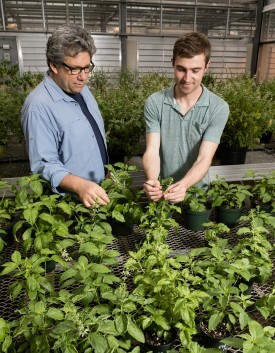 Professor James E. Simon and plant breeding Ph.D. student Rob Pyne in the basil greenhouse. After years of crosses and evaluations in fields and greenhouse, they are well down the path to developing a sweet basil variety resistant to the destructive downy mildew pathogen. Photo by Jack Rabin.